The Robert Hillestad Textiles Gallery will host a lecture on October 14 at 2:00 p.m. in Room 11 of the Home Economics Building on the University of Nebraska-Lincoln’s East Campus titled “Making the Desert Bloom: Painted Textiles for a Krishna Temple” by Kay Talwar. The lecture is free and open to all and will be followed by a reception in the gallery on the building’s second level. Talwar’s talk is being held in conjunction with the exhibition “Pigment on Cloth: Tradition, Family and the Art of Indian Pichvai Painting” now on view and continuing through November 16 in the Hillestad Gallery. The exhibition introduces visitors to the historic Indian practice of pichvais, devotional paintings on cotton cloth that were originally made as temple hangings in Nathdwara, Rajasthan. The exhibition presents the work of one contemporary family of Nathdwara painters who represent the fifth, sixth and seventh generations of pichvais artists in their lineage. The exhibition documents their continuing creation of these visual narratives, many depicting events in the life of the Hindu god Krishna. Talwar holds an M.A. in Art History from the University of Michigan. She has co-authored “Indian Pigment Paintings on Cloth” for the Calico Museum of Textiles in Ahmedabad, and “In Adoration of Krishna: Pichhwais for Shrinathji” for the TAPI Collection, Surat. For many years she has been involved in the Indian community of Los Angeles, promoting and supporting Indian art and cultural activities. 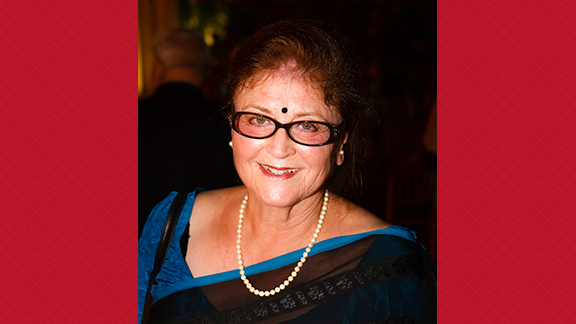 She served as Chairman of the Southern Asian Art Council at the Los Angeles County Museum of Art for six years. The Robert Hillestad Textiles Gallery is located on the second floor of the Home Economics Building on east campus, at 1650 N. 35th Street, part of the East Campus Loop (map at http://go.unl.edu/j5v). Hours are 8:30 a.m. to 4 p.m. Monday-Friday and by appointment. Admission is always free. Visitors may park in available visitor slots near the Home Economics building or in metered stalls located in the Nebraska East Union lot. For additional information, go to the gallery’s website at http://textilegallery.unl.edu.